I'm a Winner - Again! And this time I am talking about the State Fair! 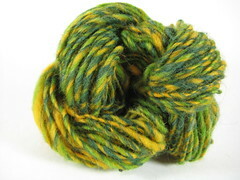 Remember this single of Cotswold curls that I spun, but wasn't quite sure what to do with? I ended up plying it with a single of pink BFL, and plying this strand kind of loosely so it was almost a coil yarn. Then I entered it in the State Fair, along with a couple of other skeins and some items I'd crocheted. I entered this skein after my planned yarn for the category fell through. 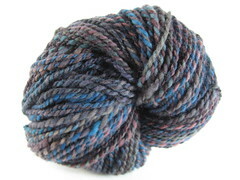 Well, the other skeins of yarn, I don't know how they fared, other than not being in the top 4 in their categories. But this one took first place! 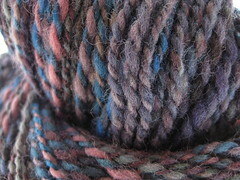 First place in the Novelty Yarn category (novelty yarn in this case meaning something other than standard spinning/plying technique). We're going to the Fair tomorrow to see it all! And when I get the yarn back, mid-September, it'll definitely have a fancy schmancy photo shoot. Yarn glamour shots. This one would look nice with backlighting. Not soft focus, though - it's fuzzy enough. I also one first place for my sweater, and 5th place (this category goes to 6 places) for a blanket. The blanket also won a separate prize, for best combination of yarn and stitch pattern. Also, this experience totally ruins the moral of the story about the other skein of yarn that didn't work out. Oh well - I guess I'm ok with it! The other skein is a story for another day. Oh! And SALE! To celebrate the still-unnamed yarn which is not yet available on Etsy, I'm having a sale through the end of the weekend - 20% off everything that's in stock! I'm happy to be featured once again in an Etsy Treasury. Treasuries are temporary galleries of (at least usually) 12 items, which a user picks based on a theme. My bubblegum pink yarn was featured in a pink gallery a few weeks ago, and today I got notified that my Galaxy yarn is being featured in a Space-themed Treasury in honor of the Discovery shuttle. Treasuries only last 2-3 days, so go see it now! The curator of this treasury, tastykaeru, makes beautiful felted jewelry. Thanks, tastykaeru, for including my yarn! Not of the State Fair, unfortunately. Not that I'm not a winner there. I don't think they've done the judging yet (though I don't expect to be a winner there). No, I'm a winner in a Phat Fiber giveaway. I won a spindle, which I assume will be lovely, though I have no idea what it looks like. There was a post on the blog saying that there were lots of unclaimed prizes, and we should go back and see if we were among those bestowed. I knew I hadn't won... had actually just told my friends the day before that I love the whole idea of the Phat Fiber box/blog/giveaway, and that I intend to donate to it soon, but that I hadn't won any giveaways yet. But I checked previous winner posts, and there I was. In June. I had won a spindle from Zebisis Designs. 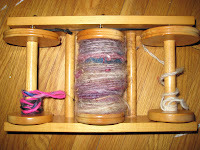 Somehow I'd missed the announcement and my spindle was languishing for 7 weeks, feeling abandoned. Now it will get the love it deserves. Time to get my own samples ready. I know which fiber I'm planning to use. Probably. Ok, I've at least got it narrowed down. No pictures. Sad. I like having pictures. Ok, how about this? Me at the beach last week, on my way to a sunburn. I am officially an entrant in the State Fair. I've never done that before, although my cousin is a blue ribbon winner for her sour cream chocolate chip cake (I think I've got that right). I entered a couple of sweaters, a blanket, and (so far) two skeins of yarn - a skein of the Tropical Island (blue-green BFL pictured in my July 31 post) and a skein of alpaca/angora I'm calling New York Swirl until I find a better name for it: Any suggestions? I'm in the middle of an out of town training for my job, which is making posting new yarn on Etsy a problem - I forgot to take its vital stats before leaving home. The training has a lot of listening time, and the instructor is understanding of needing to keep hands busy, so I not only finished the strap (and pocket) for a felted messenger bag I've been working on for a loooonnngg time (all that's left is seams and felting, yay! ), I also bought yarn and started to make the Aerial Pig (Rav link). That was a long sentence. I have a spindle along as well, and spun on the plane, but it's a little too distracting in a classroom setting. Unfortunately, it seems that pigs are shaped roughly like hats, which is to say nearly impossible for me to make. Luckily, I've got lots of time in this class, which runs 9.5 hours a day (including an hour for lunch). I've frogged a couple of times (also got a bad skein of yarn, several breaks in the plies). Mine is not looking at all like the Rav pictures, though. Well, I'm not sure why it turned sideways. It looked normal when I selected it. Oh well. I think I'll see if I can make the snout more prominent. In terms of length, theoretically I'm about halfway through and will be decreasing soon. We'll see. Mine is much more spherical (and ruffly - my typical hat problem) than the original. Time to get ready for training! I've been without internet for two days and it's driving me batty. I still can't get it on my computer - I'm writing this on Mr. Daisy's computer. And now I'm going away for a week - training for my job in LA. Assuming I can get internet there, I'm hoping to list some items on Etsy in the next couple of days. And I've got some others drying now, without photos yet. Those will have to wait till next week. Not only has my spinning gotten noticably faster in the past few weeks, but it's gotten more even. It used to be that if I split my roving unevenly, I would always spin the largest piece first, because by the second or third I'd be spinning finer and be able to get the same yardage out of a smaller amount. At spinning group I plied up the next skein of red BFL - I had already spun up the other two pieces of red BFL before going to the group. Then I decided to work on the Galaxy roving. I split it in two lengthwise, without checking to see if they had the same weight. When I split it in half again in the middle of the length, I noticed all of the turquoise was on one end, so I made sure to spin them in opposite directions - that way turquoise would be on each half. 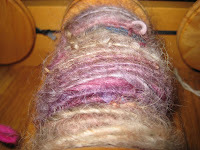 But the point is, I spun about 3 ounces of it at the group, then spun the last ounce and plied it at home. And when I got to the end of the 175ish plied yards, I had only about 6 inches left on one bobbin. See that fuzzyish piece toward the lower left, lying on the bottom end of the bobbin? (It looks kind of like a shadow, but it's fuzz.) That's the end of one single. The vertical line is the remainder of the second single - it ends before the top of the bobbin. Plus, I didn't get sunburnt (except for a small piece, less than a square inch, that I somehow missed) - last month I put sunscreen on my arms but not my neck, and I painfully regretted it for weeks. 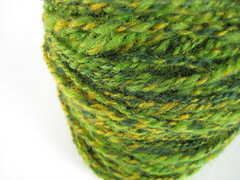 I've made my first sale - the first half of the ultra-soft blue-green BFL has been claimed. Yesterday I spun and plied a green mix of fibers I'm calling Meadow, and I spun another single of the reddish BFL I was gushing about a couple of weeks ago. I want all 8 ounces to be spun before I put it up for sale, so I'm working my way up there. 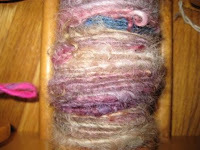 I also spun some curly Cotswold locks which did not lie down smoothly, so they're very fuzzy. I think I'm going to ply them with plain thread so it keeps the halo and the curls but is a little stronger. 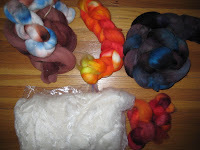 From top left: 4 ounces from FatCatKnits (on Etsy) that I call Back in the Saddle - 2/3 brown and 1/3 blue/white/brown; 4 ounces superwash merino - my first handdyed fiber, I call it Sunfire - way more vibrant in real life; 4 ounces of something, merino or falkland is my guess, source unknown, I call it Galaxy because it reminds me of photos of the Milky Way; 1.3 ounces of BFL, the stuff I mentioned earlier, that I call Campfire; and a 5 ounce batt of undyed 50% alpaca/50% silk (yummy). And I have more than 2 hours to spin before going to the spinning group, if I get off the computer. Ok, time to spin more! I'm an IT developer by day and fiber addict and enabler in my free time.